Whoa, these last few weeks just flew by! I’ve been sewing but haven’t had much time to blog or take pictures. I finally have time to write now and I took a bunch of pictures earlier this afternoon so there will be more posts following this one. I was playing with this rounded triangular shape, trying to figure out how to make it work best for my needs. I don’t like it as a stud because it’s too large for how stiff it is. But it’s perfect as a drop. Now the question was how to attach it to the earring finding. 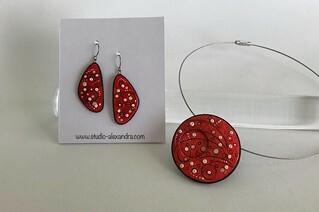 I started out with an interchangeable style – by making a hole large enough to accommodate a small hoop. This works well because I have some metal allergies and earrings that I can wear comfortably have been few and far between. Then I thought, what about a small stud with an attached drop? I had some titanium findings that would work for this style so I gave it a try – it’s the pair on the right. Now that I’ve been wearing both styles for a while, I have a slight preference for the interchangeable style, for no reason I can actually articulate. 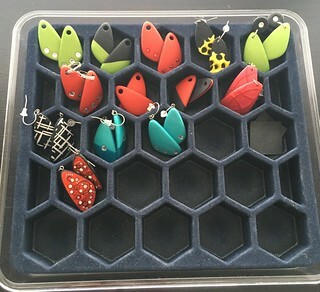 Another earring style I tried is the fishhook – several pairs above, including the teal ones, are made like this. The findings are titanium again – comfortable for my ears. This style requires a second curing to get the eyepin incorporated into the drop. That’s a bit of extra work but totally worth it, I think. 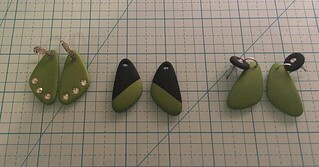 I made these pieces following Martina Burianova’s tutorial. Her gorgeous photography and easy-to-follow instructions made it a breeze. Her technique requires a lot of waiting for things to dry and/or cure between steps and I apparently don’t have quite enough patience, hehe. Do check out her work – it is breathtakingly gorgeous. And that’s all I have tonight. This weekend, I’ll tell you about my recent sewing projects. Thank you, Lotta! You’re so kind. Beautiful earrings, Alex. Looks like you have been busy.